« Godfrey Elfwick writes for the Spectator again! It’s chocolate covered, looks like it might be peanut butter inside, and about 4 inches in diameter. The “chewed” side seemed more definitely chewed, with tooth marks, when viewed in person, than it does in this photo. I went out about 2 hours later, and the treat was gone. Presumably, the squirrel came back and absconded with it into the woods, which is a better place for squirrels to sit and eat. I’m not sure if chocolate is good for squirrels. Chocolate is full of alkaloids, and unhealthy for some animals. I do, however, vaguely recall that squirrels in Costa Rica will eat cacao pods off trees, and this abstract seems to confirm that recollection. The tropical squirrels are in the same genus, but a different species, than the eastern gray. This entry was written by whyevolutionistrue and posted on December 16, 2018 at 2:30 pm and filed under squirrels with tags eastern gray squirrel, squirrels. Bookmark the permalink. Follow any comments here with the RSS feed for this post. Both comments and trackbacks are currently closed. That’s a Reese’s Peanut Butter Cup. I had one exactly like that about two hours ago! A giant one! The ones I’ve eaten are not 4″ in diameter. The claim is 2 inches which seems about right to me. However, based on the Wikipedia page, they have made a large version, though I believe the one in the picture is the standard version. 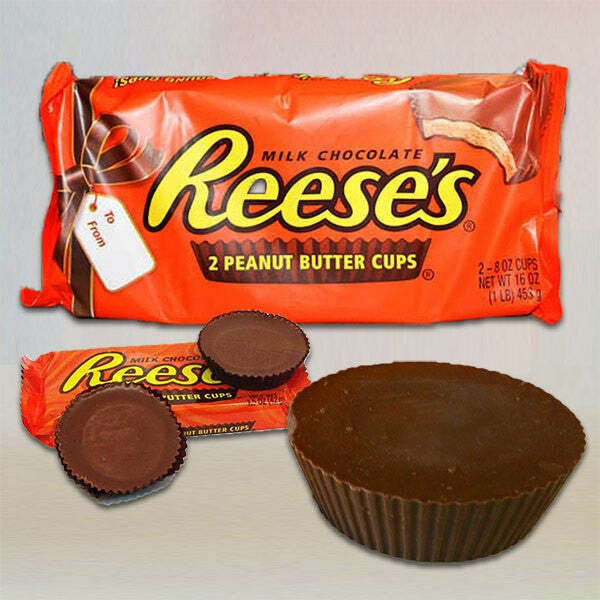 UK calling: Tesco is selling gigantic Reese’s peanut butter cups which weigh 13 times more than the normal-sized treat. The diameter is in the region of 4″ judging from a pic of the thing in someone’s hand. And I thought the US was the home if giant candy. When I was in high school, I’d get my friends to being me back the 1 pound bag of peanut M&Ms because we couldn’t get that size in Canada. Now that size is everywhere. A 4-meter diameter one is under development at the test facility outside Hershey, and a 4 km diameter “supercup” is on the drawing board. I once saw a squirrel up a tree in a parking lot making a “weeeeee” sound. I looked up and saw he was holding a big apple with a bite out of it. I guess he was trying to scare me away from his treasure. The apple was almost as big as him. I believe chocolate is poisonous to all animals; it is a matter of size relative to the amount of chocolate eaten and the ability to metabolize theobromine. As large animals that metabolize theobromine easily, humans can eat a lot of chocolate without serious harm, but a small animal like a squirrel could be poisoned. On the other hand, that looks like milk chocolate which has less theobromine. in the SF Bay Area, are notorious for eating a portion of fruit and tossing it away. We don’t have grey ones here. They’re in Sacramento tho, and have protected status. If I were to pick a way to die…death by chocolate would be at the top of my list. Many restaurants round here market “Death by Chocolate” as a dessert option. It varies, but is typically a chocolate sponge containing chocolate chips served with a chocolate sauce. Sadly, they almost always use the diluted abomination which Britain allows to be described as “milk chocolate” and the EU thinks we should call “cocoa-flavoured mixed dairy and vegetable fats”. I like chocolate but I steer clear of dessert items with names like “Death by Chocolate”, “Chocolate Insanity”, or the like. It seems a very American thing to think that if a little chocolate is good, a massive amount is better. Erik Russell at Kaysens, a London-based dessert manufacturer, supposedly came up the name “Death by Chocolate” in ’84, but I remember it from before that date. Now it’s a UK & EU trademark & there’s a separate trademark for it in the USA. In the UK the trademark isn’t enforced & there’s many recipes for it. I have seen some very bad recipes where the levels of choc & sugar are cloying [often served with a choc sauce too! ], but that’s silly stuff from people who don’t understand food needs contrast. I’m only judging “Death by Chocolate” from experience. I can see now it is possible to create one I would eat. This is why my vet strongly discourages me from just letting my cat help himself to my coffee. Talking of vets ,got to take my cat Misha to the vet at 4pm ,he seems to have a wound on one of his toes on his back leg .He made one hell of a racket last night when i first noticed it .Got the front door locked now so he can’t disappear ,he is now prowling around giving vent to the odd hiss now and again . I think he suspects a trip to the vet is on the cards ,he is due his shots next month so i will get that done as well .I am hoping he will bite the vet this time . Reminded me of the time when we took one of our cats to the vet for shots and a checkup. He was purring so loudly that the vet couldn’t hear his heartbeat very well. She had an instant solution: turn on the tap! The sound of water was enough to stop the purring. Not to all animals. Rats do not experience the toxicity of theobromine that dogs and even cats do. Apparently, large quantities are associated with sterility in male rats, but no other ill effects. Rats love chocolate, as I learned with one of my rats who absconded with an entire Hershey bar when I left one in his vicinity. Trying to wrangle it away from him was not easy! So do squirrels pronounce it “Rees-ees” or “Rees-is”? Missed an opportunity to find out when this one got away. They pronounce it “chechechecheche” which is generic squirrel for “get away from me and/or my stuff”. The post was made by Greg M., not Jerry. Yeah, Jerry knows his sweets. 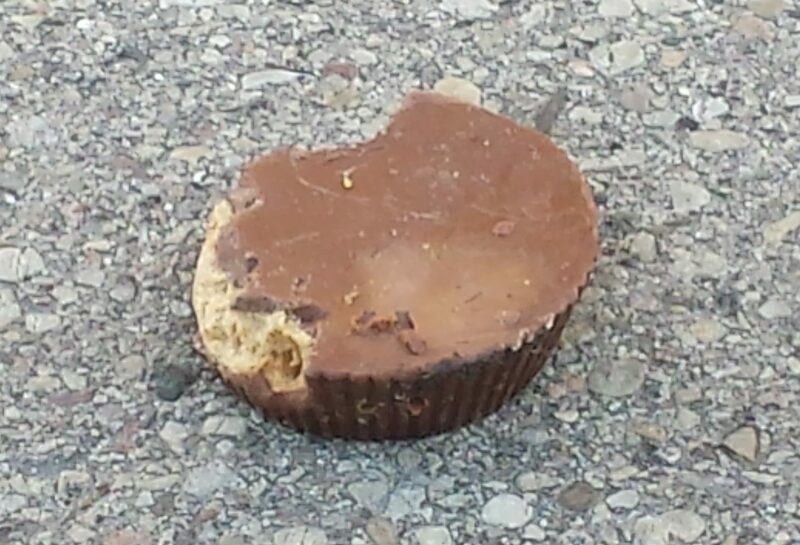 What planet is the Professor from to not recognize a Reese’s peanut butter cup? Apropos the earlier discussion on size, it seemed too big to be a Reese’s Peanut Butter Cup. It was indeed on the order of 4 inches. I did not measure it, but compared it to the size of my mobile phone, and then measured my phone when I got to my office.